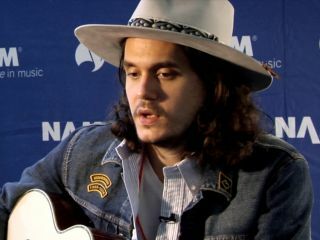 NAMM 2012: Singer-songwriter and guitarist John Mayer debuted his brand-new signature Martin guitar, the aptly named 00-45SC John Mayer Edition, at the NAMM show. The model will be limited to a run of just 25 pieces. "There's something about a smaller-bodied acoustic guitar that has always appealed to me," said Mayer. "In one glance it inspires me to write, travel, perform and age along with it. "Not very long ago, I was inspired to return to a completely natural way of writing and recording music, and at the center of that vision were the Martin 00-sized guitars that defined an era of brilliant songwriting in the '60s and '70s. The 00-45SC John Mayer Edition is my vision of the ultimate 00-45 come to life. It's simply perfect."